Sage Singer befriends an old man who's particularly beloved in her community. Josef Weber is everyone's favorite retired teacher and Little League coach. One day he asks Sage for a favor: to kill him. Shocked, Sage refuses... and then he confesses his darkest secret—he deserves to die, because he had been a Nazi SS guard. And Sage's grandmother is a Holocaust survivor. How do you react to evil living next door? Can someone who's committed a truly heinous act ever atone for it with subsequent good behavior? Should you offer forgiveness to someone if you aren't the party who was wronged? And most of all—if Sage even considers his request, is it revenger... or justice? The Storyteller is about how a women copes when she discovers unexpected and life changing news about a man she thought was her friend. The blurb captivated me straight away and I was instantly hooked as soon as I began reading. It didn't take me long to finish the book. I find personal accounts about the Holocaust really interesting which is a main reason why I enjoyed this book so much. There are accounts from both sides, giving different opinions which is one of the main reasons I enjoyed it so much. I've read many of Jodi's books before and this is nothing like her other books. This is harrowing and thought provoking and has something for everyone. You get to find out how each side dealt with the Holocaust along with a Gothic fairy tale hidden in the back story; even a little bit of romance! There are a few twists/unexpected moments and I really enjoyed reading her latest novel! 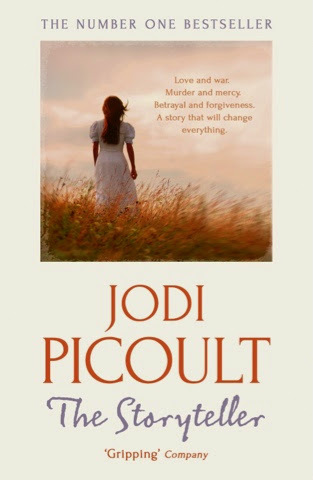 I would recommend any of Jodi's novels but this is definitely may favourite so far.